Windows Vista has a nice little hidden feature which allows us to copy full file path to clipboard. 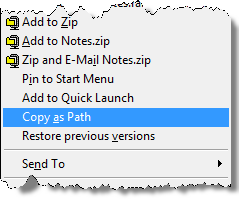 If you hold Shift Key and right click on a selected file, a new option appears in the context menu with name "Copy as Path".This option copies the full path of the selected file to clipboard. This hidden feature comes very handy option when you want to copy and paste network file paths in emails and other documents. Can you guess why is this feature hidden in Vista?